I still eat soup in the summer. And, even though it’s not technically summer yet, I’m going to make the case for this soup. Even though it’s warm outside. It’s soup without being too stew-y. This bright, very green recipe manages to be both comforting and light. 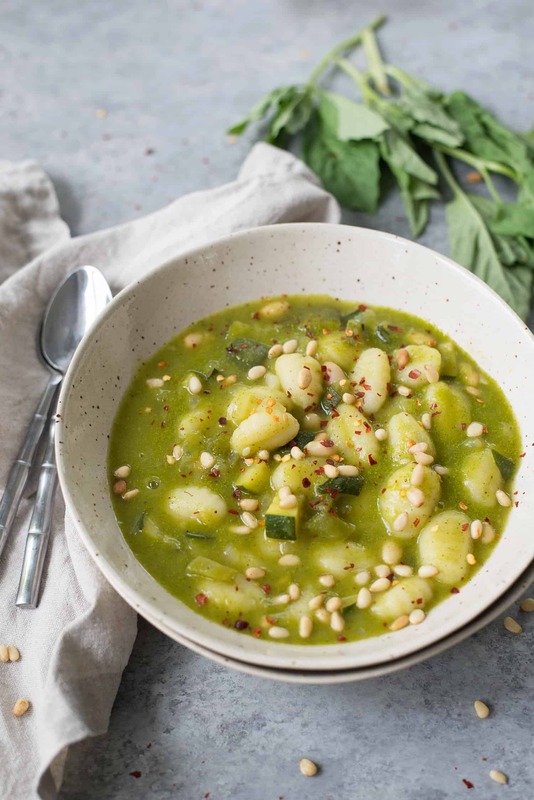 With pillows of gnocchi, zucchini and lots of basil, it’s the perfect recipe to make when you want something healthy (that’s not a salad). I was inspired to make this dish after making my spring gnocchi one too many times last month. That dish gets a lot of mileage in my house, a favorite for both entertaining and simple weeknight dinners. Part of the fun of being pregnant is that I get turned off by even favorite foods very easily. So, I had all the ingredients for my spring gnocchi but just couldn’t bring myself to make it again. Soup it is. 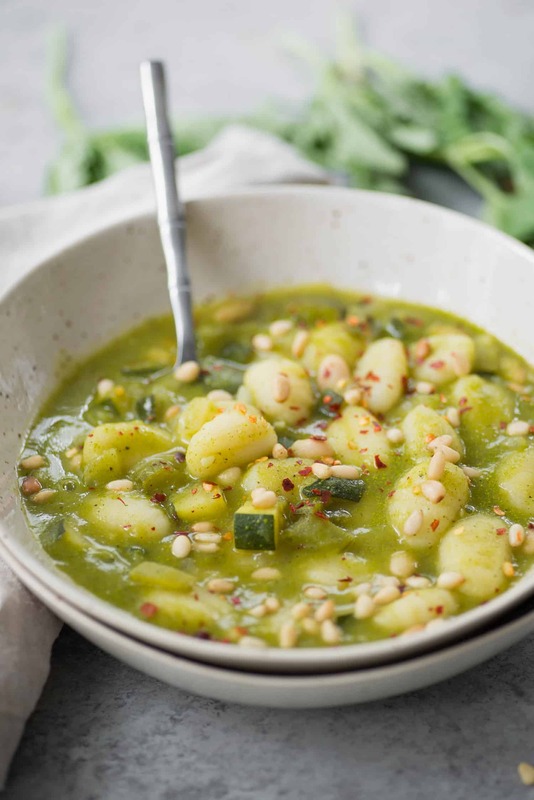 A creamy base of pureed vegetables and herbs, studded with zucchini, lots of gnocchi, basil and pine nuts for crunch. Not a lot of fuss yet super delicious, exactly the way I want my meals this time of year. 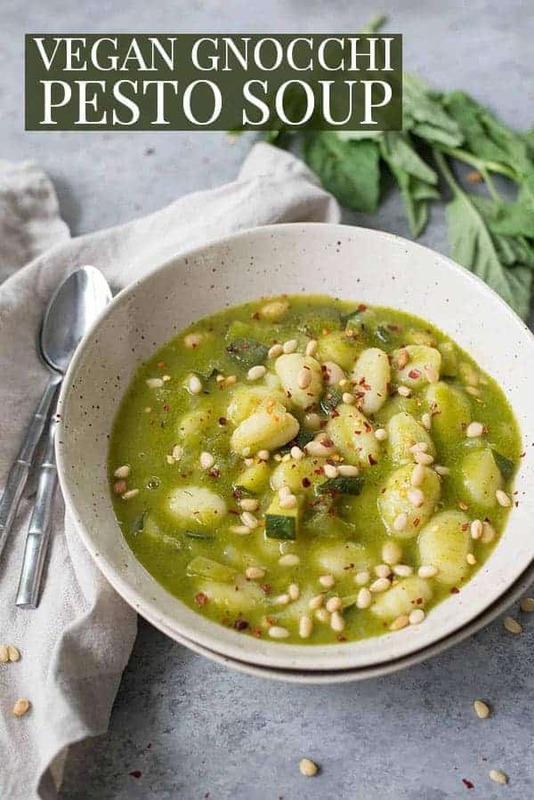 Gnocchi Pesto Soup! 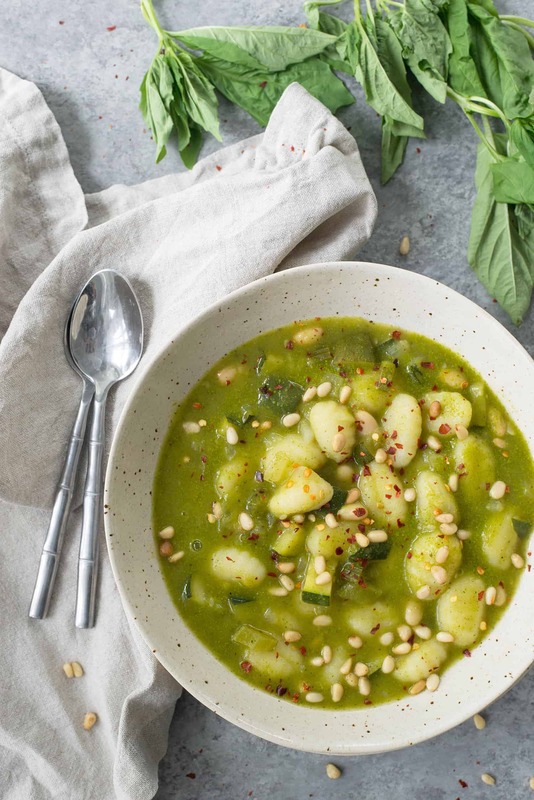 This creamy pesto soup is loaded with herbs, zucchini and pillowy gnocchi. Vegan. Heat the olive oil in a stockpan/dutch oven over medium heat. Add the zucchini and garlic and let saute for 3-4 minutes until zucchini is lightly browned and soft, stirring often. Remove 1/3 of the zucchini (roughly 1 cup) and set aside. Add in 3 cups of the vegetable broth, dried herbs, a few grinds of freshly ground pepper and salt. I found that even with the broth, I needed 1/4 teaspoon of salt, but feel free to add more/less depending on preference. Bring to a low boil and let cook until zucchini is very tender. While the zucchini is cooking, whisk together the remaining 1 cup broth with cornstarch/arrowroot starch in a large cup. Reduce the zucchini mixture to low, then add in the arrowroot and broth, stirring often until thickened. Add in 1/2 of the basil leaves and remove from heat. Using an immersion blender or transferring to a regular blender, blend until very creamy and smooth. Taste for seasoning, adding more if needed. Place creamy soup base back in the pot along with the reserved cooked zucchini, gnocchi and beans. Cover and let cook for 3-4 minutes, until gnocchi are cooked through. Stir in remaining basil leaves and toasted pine nuts. Enjoy immediately! I love how springy/fresh yet cozy this soup looks. I can imagine how satisfying it would be to bite into those little gnocchi dumplings in a hot soup. yuuum! This is really good! I added a couple spoonfuls of pesto to spice it up and we served it with grated Parmesan. Easy weeknight meal! This looks wonderful. Do you know the calorie count per serving?